Injuries to major abdominal vessels are uncommon but highly lethal vascular crises. Predictably, exsanguinating hemorrhage is the most important cause of early death. Intra-abdominal vascular injuries are associated with extremely rapid rates of blood loss and pose challenges of exposure during celiotomy, [1, 2, 3] given the posterior position of the major abdominal vascular structures (except for the portal vein and the hepatic artery). 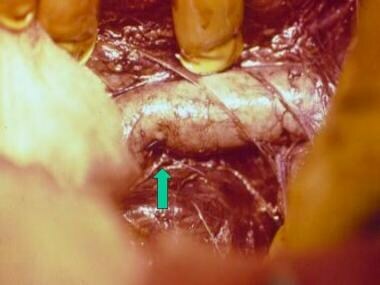 Essential to the successful management of these injuries is a thorough knowledge of intra-abdominal vascular anatomy and a familiarity with the techniques of proximal and distal control combined with selective application of primary repair, bypass, or ligation as indicated. Midline supramesocolic hemorrhage or hematoma (superior to the transverse mesocolon) is usually caused by injury to the suprarenal aorta, the celiac axis, the proximal superior mesenteric artery (SMA), or the proximal renal artery. Midline inframesocolic hemorrhage or hematoma results from infrarenal aorta or inferior vena cava (IVC) injury (see the image below). Lateral perirenal hematoma or hemorrhage suggests injury to the renal vessels or kidneys. Lateral pelvic hematoma or hemorrhage indicates injury to the iliac artery, the iliac vein, or both. Hepatoduodenal ligament hematoma or hemorrhage indicates injury to the portal vein, the hepatic artery, or both. Abdominal vascular injuries. Tangential gunshot injury to the inferior vena cava repaired by means of lateral venorrhaphy (arrow). In blunt trauma, rapid deceleration during a motor vehicle accident (MVA) results in an avulsion of the small branches of major vessels (eg, mesenteric tear). Another mechanism of injury is related to a direct crush or blow to the major vessels, resulting in an intimal tear with thrombosis or vessel rupture and hemorrhage. Penetrating injuries directly disrupt the vessel wall or create intimal flaps secondary to the blast effect. Because of the anatomical position of the major vascular structures in the abdomen, injuries to these vessels have a high probability of association with other major injuries in the abdomen, particularly to the small bowel. Hemorrhagic shock from intra-abdominal hemorrhage often leads to metabolic acidosis accompanied by coagulopathy and hypothermia—the so-called lethal triad of trauma. The use of systolic blood pressure at any predefined cutoff value when considered out of context with other potential indicators of shock is neither particularly specific, nor sufficiently sensitive, to be useful clinically for the diagnosis of shock. In contrast, the shock index (ie, heart rate divided by systolic blood pressure) may suggest compensated shock when either heart rate or blood pressure considered separately do not. Metabolic acidosis in trauma patients is the result of lactate overproduction, most often from decreased oxygen delivery as a result of hypovolemic shock. Acidosis adds to the overall lethality of preexisting injury primarily by depression of myocardial contractility and by impairment of coagulation. Furthermore, hypothermia (below 34°C) inhibits platelet function and slows coagulation factor activation. This self-perpetuating cycle is responsible for 80% of deaths in patients with major vascular injury and must be rapidly corrected to prevent a dismal outcome. The incidence of abdominal vascular injuries in military conflicts is surprisingly low: generally less than 5% of all vascular injuries. In contrast, approximately 30% of all vascular injuries observed in civilians occur in the abdomen. This striking difference between combat and noncombat vascular trauma can be attributed to the low energy of missiles from civilian handguns and the short prehospital transit times in urban settings, which make it more likely that a civilian with penetrating abdominal vascular injury will survive long enough to reach surgical care. The incidence of abdominal vessel injury in patients with blunt trauma is estimated at approximately 5-10%. A similar incidence of 10.3% is reported in patients with penetrating stab wounds to the abdomen. Patients with gunshot wounds (GSWs) to the abdomen will have major vessel injury in 20-25% of cases. Fabian TC. Abdominal trauma including indications for celiotomy. Feliciano DV, Moore EE, Mattox KL, eds. Trauma. 3rd ed. Norwalk, Conn: Appleton and Lange; 1996. 441-59. Cox EF. Blunt abdominal trauma. A 5-year analysis of 870 patients requiring celiotomy. Ann Surg. 1984 Apr. 199(4):467-74. [Medline]. [Full Text]. Morris JA Jr, Eddy VA, Rutherford EJ. The trauma celiotomy: the evolving concepts of damage control. Curr Probl Surg. 1996 Aug. 33(8):611-700. [Medline]. Ganter MT, Pittet JF. New insights into acute coagulopathy in trauma patients. Best Pract Res Clin Anaesthesiol. 2010 Mar. 24(1):15-25. [Medline]. Fikry K, Velmahos GC, Bramos A, et al. Successful selective nonoperative management of abdominal gunshot wounds despite low penetrating trauma volumes. Arch Surg. 2011 May. 146(5):528-32. [Medline]. Feliciano DV. Abdominal vascular injury. Feliciano DV, Moore EE, Mattox KL, eds. Trauma. 3rd ed. Norwalk, Conn: Appleton and Lange; 1996. 615-33. Feliciano DV. Injuries to the great vessels of the abdomen. Wilmore DW, Cheung LY, Harken AH, Holcroft JW, Meakins JL, eds. Scientific American Surgery. New York, NY: Scientific American; 1996, revised 1998. Vu M, Anderson SW, Shah N, Soto JA, Rhea JT. CT of blunt abdominal and pelvic vascular injury. Emerg Radiol. 2010 Jan. 17(1):21-9. [Medline]. Dayal M, Gamanagatti S, Kumar A. Imaging in renal trauma. World J Radiol. 2013 Aug 28. 5(8):275-84. [Medline]. [Full Text]. Genovese EA, Fonio P, Floridi C, Macchi M, Maccaferri A, Ianora AA, et al. Abdominal vascular emergencies: US and CT assessment. Crit Ultrasound J. 2013 Jul 15. 5 Suppl 1:S10. [Medline]. [Full Text]. Benjamin ER, Siboni S, Haltmeier T, Lofthus A, Inaba K, Demetriades D. Negative Finding From Computed Tomography of the Abdomen After Blunt Trauma. JAMA Surg. 2015 Dec 1. 150 (12):1194-5. [Medline]. Harding A. Blunt Trauma Patients May Be Discharged After Negative Abdomen CT. Reuters Health Information. Available at http://www.medscape.com/viewarticle/851568. September 28, 2015; Accessed: December 21, 2015. Kimball EJ, Adams DM, Kinikini DV, Mone MC, Alder SC. Delayed abdominal closure in the management of ruptured abdominal aortic aneurysm. Vascular. 2009 Nov-Dec. 17(6):309-15. [Medline]. Ding W, Wu X, Pascual JL, Zhao K, Ji W, Li N, et al. Temporary intravascular shunting improves survival in a hypothermic traumatic shock swine model with superior mesenteric artery injuries. Surgery. 2010 Jan. 147(1):79-88. [Medline]. Vandromme MJ, Griffin RL, Kerby JD, McGwin G Jr, Rue LW 3rd, Weinberg JA. Identifying risk for massive transfusion in the relatively normotensive patient: utility of the prehospital shock index. J Trauma. 2011 Feb. 70(2):384-8; discussion 388-90. [Medline]. Doll D, Matevossian E, Kayser K, Degiannis E, Hönemann C. [Evisceration of intestines following abdominal stab wounds : Epidemiology and clinical aspects of emergency room management.]. Unfallchirurg. 2013 Jun 12. [Medline]. Moore LJ, Brenner M, Kozar RA, Pasley J, Wade CE, Baraniuk MS, et al. Implementation of resuscitative endovascular balloon occlusion of the aorta as an alternative to resuscitative thoracotomy for noncompressible truncal hemorrhage. J Trauma Acute Care Surg. 2015 Oct. 79 (4):523-30; discussion 530-2. [Medline]. * Grade I injury includes the following: No named superior mesenteric artery or superior mesenteric vein branches; nonnamed inferior mesenteric artery or inferior mesenteric vein branches; phrenic artery/vein; lumbar artery/vein; gonadal artery/vein; ovarian artery/vein; other nonnamed small arterial or venous structures requiring ligation. Disclosure: Received research grant from: Shriners Hospitals for Children; Physical Sciences Inc, Mediwound. The authors and editors of Medscape Reference gratefully acknowledge the contributions of previous author Aleksander R Komar, MD, to the development and writing of the source article.